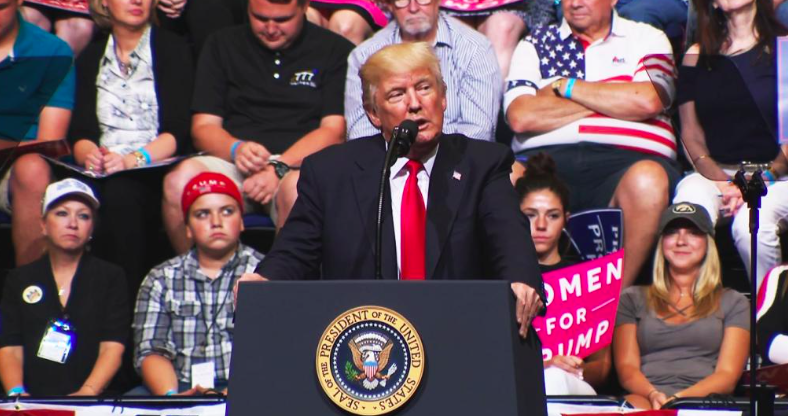 Prior to President Trump’s visit to Fargo, I took a shot at guessing what he might say at the rally for Kevin Cramer, who got three minutes of mic time and an awkward bro hug. My predictions; followed by the real deals. Stupid media. That’s exactly what they would write. “Maxine — she’s a beauty,” Trump said. “I mean, she practically was telling people the other day to assault! Can you imagine if I said the things she said? He has, and I can imagine. Heitkamp isn’t within a mile of being liberal. “When Heidi ran for office she promised to be an independent vote for people of North Dakota. Instead, she went to Washington and immediately joined Chuck, you know who Chuck is, and Nancy, and now they have a new leader. “You need a senator who doesn’t just talk like they’re from North Dakota, but votes like they’re from North Dakota. That’s what you need, and that’s Kevin Cramer,” Trump said. I think he’s just old and tired. It has been a new frontier for a long time. He doesn’t love gay people. I doubt if he loves me, and I’m OK with that. He doesn’t have any Democratic friends. The tax scam; borrowing money to redistribute to the rich. “We had a trade deficit because they send the Mercedes in, they send the BMWs in, they send their products in, we send things to them and they say, ‘no thank you, we don’t take your product’. The feeling is mutual, I’ve read. Not what democrats want on this planet. It’s about 4 feet long. Trump likes billionaire Harold Hamm, an oil baron. My Pillow brand. I don’t believe Trump uses a normal pillow. No. She isn’t. She is a liberal, African-American woman, though. Still kicking John McCain, when he is dying. He claimed to have plan, the greatest plan, many months ago, so I doubt it. Stupid cameramen. Won’t do what Trump says. There weren’t 15,000 or 18,000 people that couldn’t get in. Probably not, but he did movies. She doesn’t want to protect MS-13. Clinton has not been found guilty for anything. He’s had a tough life. Kim Jong-un makes a great play date. The Mars rover is pretty famous. Your stuff seemed a lot smarter than the actual quotes. Is this what the crowd was cheering? You nailed it again Ron. Just when I can’t take it anymore you write something that allows me to have a hearty chuckle about the mess we are in. Thanks.